Preparations A.M.G. Promotions by setting up many events throughout Italy and abroad. The space and its organization. Whether it's indoor or outdoor spaces, AMG Productions Promotions are always able to create the ideal location for any event, thanks to modular structures, furniture and modular. Our marquees always offer the right environment for special events, product presentations, sporting events, fairs and exhibitions, concerts, fashion shows, exhibitions, meetings and receptions. The tendocoperture are able to solve any problem fitting both stable and traveling in an effective and secure facilities are installed in less time and with competitive costs, and the assembly is done in compliance with all applicable standards with the participation of only specialized personnel. The multifunctional modular coverings, designed and built by AMG Productions Promotions, are available for sale or just to hire, or complete lack of interior support structures, equipment and accessories (running boards, panels, lighting systems, different types of floors, stairs, platforms, partitions, toilets, etc..). The purchase and lease are aimed at different sectors: private, industries, organizers of events and trade shows, restaurants, cafes, pubs, hotels, sports facilities, swimming pools, catering companies and car dealerships. 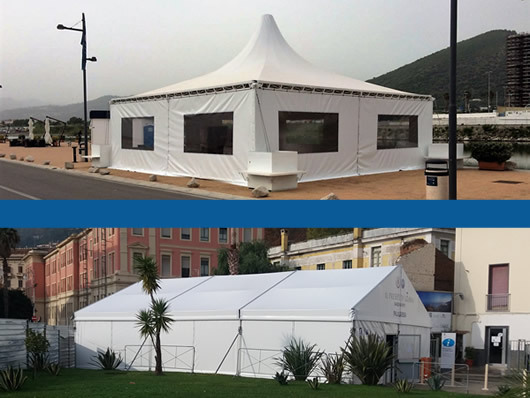 Whether it's indoor or outdoor spaces, AMG Promozioni Productions is always able to create the ideal location for any event, thanks to modular structures, furniture and modular. Our marquees always offer the right environment for special events, product presentations, sporting events, fairs and exhibitions, concerts, fashion shows, exhibitions, meetings and receptions. Transform and prepare unusual or unconventional spaces adapted to the needs of the event: this is the mission of "ALLESTIMENTI A.M.G. PROMOZIONI S.R.L. ", able to meet any setting - from exhibitions to concerts, from meetings to receptions - with a complete range of modular coverings, furniture and modular, useful for all applications, both for their size and functions, standardized for quality and safety. Careful planning, with the use of advanced technologies and the collaboration of qualified staff, allows for temporary structures for events quickly and efficiently. Careful choice of materials: the structure of trade fair has made a strong and solid aluminum or galvanized steel armor, the cloth cover and side cover are PVC material. Materials meeting the highest standards of quality and safety, subject to special treatments that make them resistant to atmospheric agents and long lasting. The covers multifunctional modular designed and built by AMG ALLESTIMENTI are available for sale or just to hire, or lack of interiors complete with running boards, panels and light. The purchase or lease are for many areas: private industry, organizers of events and exhibitions, but also restaurants, cafes, pubs, hotels, sports facilities, swimming pools, catering companies and car dealerships. All covers come in various shapes and sizes. The design and construction allows, in fact, STANDS AMG to meet specific requirements: in addition to standard sizes, it is possible to create structures out of range. The quality of materials and technology used are stated on SOA, for the construction of sheds and tents read in PVC. AMG Promozioni Productions is always able to create the ideal location for any event, thanks to modular structures, furniture and modular. AMG Productions is able to provide rent everything you need for organizing Exhibitions, Meetings, Catering, concerts. Among our products are: Pagodas, Tents, Stages, Chairs, Carpet, Toilet Furniture, Lighting Systems, etc..
AMG Productions offers for sale many items of construction such as pagodas, Tents, Sheds for storage, etc.. Copyright © 2017. All Rights Reserved. Design And Developed by ALBA Communication.